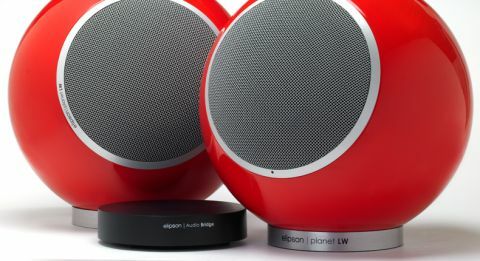 Elipson Planet LW Bridge system review | What Hi-Fi? We like this Elipson package. It’s beautifully built, mostly wireless and sounds pretty decent too. And we can’t overlook that distinctive appearance either. Whether you go for the looks or not, at least it makes a welcome change from the usual rectangular wooden boxes we normally come across. At the heart of this package are the Planet LW speakers. These are the size of a basketball and available in neatly applied black, white or red gloss finishes. Don’t worry about them rolling off their supports, Elipson supply smart-looking metal rings to act as bases to stop them moving around. These speakers use a two-way coaxial driver array comprising of a 16.5-cm mid/bass (loaded by a rear firing port) and a fabric dome tweeter. There are two 50-watt amp modules on each enclosure – one for each drive unit – so these are truly active rather than just powered. The amplifier modules are the well-known ICEpower designs developed by Bang & Olufsen. One of the main selling points of the Planet LWs is that they are wireless; the connection works at 16-bit/44.1kHz. As usual, wireless doesn’t mean there aren’t any wires involved, as you still need a mains feed to each speaker. Use either of the supplied transmitting dongles – one USB and the other a 30-pin Apple version – and you link to the speakers directly. The designated left hand LW is the master. Aim the cheap-feeling credit card remote towards this when you want to adjust volume. The Elipson Audio Bridge adds aptX Bluetooth, optical and analogue connectivity. These sources connect to the Bridge and it links to the Planet LW speakers wirelessly. The speakers won’t work with both the Bridge and the dongles simultaneously, only one at a time. Getting set up is easy: simply establish the wireless link and off you go. Within a few minutes we’re listening to music. We start off with the Audio Bridge in the set-up, using our reference Naim NDS /555PS streamer as an analogue source. The results are decent but not inspiring. We listen to Of Monsters and Men From Finner and are pleased with the overall presentation. It’s pretty balanced across the frequency range with good reach at both extremes. Bass is nicely solid and reasonably taut, providing a good foundation for the rest of the frequency range. The drive units are well integrated and there’s a combination of stability and control that most passive alternatives would find hard to better. It doesn’t take long for us to get the feeling that these speakers play things a little too safe, though. There isn’t the attack we expect nor enough of the energy we know is in the song. Greater transparency would be welcome too. It turns out that the analogue input is to blame to a large extent, as switching to optical and to a lesser degree, Bluetooth shows. We wouldn’t say the issues go away with the digital connections, but things improve notably – enough for us to have fun listening to a range of music from Outkast to Elvis. We power down the Audio Bridge and use the supplied dongles; the USB one with our MacBook and the other with our iPad. If anything, going directly to the Planet LWs adds a little more clarity and sparkle to the performance. Tchaikovsky’s Marché Slave Op.31 is delivered with conviction and decent scale. Moving the speakers close to a rear wall helps with outright authority without unbalancing tonality much; bass remains decently articulate in this position too. We admire Elipson’s fresh approach to speaker design. This package is a welcome change to the traditional options we normally see. The wireless aspect proves stable, though we have doubts about the quality of the analogue to digital conversion that goes on inside the Audio Bridge. Even at their best the Planet LW speakers still sound a little restrained, but they’re insightful enough to remain interesting to listen to. If the style and convenience appeal take a serious listen.